AQC Industries spent this last week down south, in Phoenix, at the Varitec Solutions Fiesta Grande. The event included food, fun, networking and many educational opportunities. 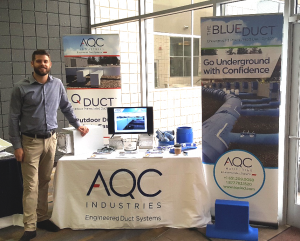 AQC’s team enjoyed meeting many attendees interested in the BlueDuct, QDuct, and PalDuct pre-insulated duct systems. AQC’s unique line up of cutting-edge and highly engineered products are great for any job, big or small. Customers are thrilled with the versatility of the duct products, whether the project is residential, commercial or industrial. The products serve as advanced alternatives to fiberglass and metal ductwork. AQC looks forward to working with the companies and individuals who attended the show. Thank you to the Varitec Solutions team for putting together a great event!